Mr. Chairman, Ranking Member Manzullo, and Members of the Subcommittee, thank you for inviting me here today to testify about the growing U.S.- Cambodia bilateral relationship and, in particular, Cambodia’s outstanding bilateral debt to the United States. Given the many challenges that Cambodia faced as recent as a decade ago, the country has come a long way in recent years. It is enjoying increasing political stability and is slowly recovering from 30 years of war, including the atrocities of the Khmer Rouge era. Cambodia’s economy was the seventh fastest growing economy in the world over the past decade. While Cambodia experienced a recession in 2009, current predictions call for a return to strong growth in 2010 and 2011. There has been meaningful progress on political and social issues as well. National elections in July 2008—while falling short of international standards on several counts—were peaceful and allowed the Cambodian people to express their preferences in an open and fair manner. The Cambodian government allowed significantly greater freedom to the political opposition during the 2008 elections than in previous elections and showed some willingness to engage on civil liberties and human rights issues. The government recently passed anti-corruption legislation and revised its massive penal code—significant steps in Cambodia’s fight against corruption. Cambodia has also made commendable progress in combating human trafficking, increasing prosecutions and convictions of traffickers, and launching a new National Committee to combat human trafficking, as well as establishing new national minimum standards on victim protection. According to an August 2009 public opinion poll, 79 percent of the Cambodian population believes that the country is headed in the right direction. 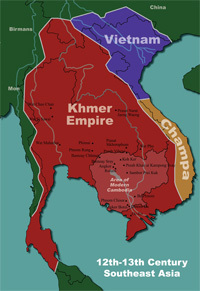 In regional and global arenas, Cambodia has sought a larger role in recent years, as illustrated by its participation in international peacekeeping efforts, its involvement in the Lower Mekong Initiative in partnership with the United States, and its campaign for a rotating seat on the UN Security Council. Cambodia’s main foreign policy challenge is, not surprisingly, managing relations with its larger neighbors. Cambodia-Thailand relations have been strained since 2008, in part related to border disputes, but bilateral dialogue has begun to diminish that tension. Relations with Vietnam are good, but final resolution of an ongoing Cambodia-Vietnam border demarcation process remains elusive. China is an increasingly important provider of assistance and foreign investment in recent years, a fact that encourages Cambodia to keep relations with China on a positive footing. Despite a generally positive trend on most of Cambodia’s domestic matters, several economic and political issues continue to cause significant concern among local populations as well as the international community. Most Cambodians remain poor, with endemic corruption and impunity limiting efforts to improve their standard of living. Political expression is stifled, including by employing criminal defamation and disinformation laws to intimidate and prosecute politicians and journalists. The judiciary remains weak, politicized, and overwhelmed. Arbitrary arrests and extrajudicial killings remain a problem. Land disputes and forced evictions, sometimes accompanied by violence, persist. HIV/AIDS and maternal mortality as well as persistent gender based violence stand as critical areas for continued improvement. All of these issues must be successfully and fully addressed for Cambodia to achieve its full democratic and economic potential. U.S.-Cambodian relations have continued to improve over the past few years. The tempo of interaction has quickened, and there has been both a broadening and deepening of positive engagement in a number of key areas. We benefit from Cambodia’s cooperation on law enforcement issues, human trafficking, counterterrorism, demining, and efforts to account fully for Americans missing from the Indochina conflict. Our security cooperation with Cambodia is maturing, allowing us to focus even more on such areas as defense reform and professionalization, regional cooperation, international peacekeeping, border and maritime security, counterterrorism, and civil-military operations. The Global Peace Operations Initiative “Angkor Sentinel” exercise in 2010 was a milestone in our growing military-to-military cooperation and exemplifies Cambodia’s commitment to international peace and stability. With United States encouragement and support, Cambodia has taken increasingly responsible positions on the world stage, including sending de-mining teams to participate in UN missions to the Central African Republic, Chad, and the Sudan. We have actively supported the Khmer Rouge Tribunal’s efforts to bring perpetrators of that era’s atrocities to justice, and commended the tribunal’s handling of the Kaing Guek Eav, aka “Duch,” case. We paid close attention to previous allegations of mismanagement and corruption within the court administration, and successfully pushed for the appointment of an Independent Counselor function in August, 2009. Since then, the Independent Counselor has developed as a credible oversight and preventive mechanism. We and other donors are satisfied with its work. On March 31 of this year, Ambassador-at-Large for War Crimes Stephen J. Rapp announced a U.S. contribution of $5 million in FY2010 Economic Support Funds to the court, and we will seek ways to continue our support. Former Ambassador-at-Large for War Crimes Clint Williamson was recently appointed by the UN as Special Expert to the court in order to provide legal and administrative expertise as it continues its work. Unfortunately, Cambodia’s December 2009 forced removal to China of 20 Uighur asylum seekers, in contravention of its international obligations and long-standing cooperation with the UN High Commissioner for Refugees, has complicated our efforts to further deepen the bilateral relationship. We have called on the government publicly and privately to uphold its international obligations to asylum seekers and refugees in the future, and seek assurances that cooperation on these issues in the future will be the norm. We also continue to push the Cambodian government on human rights and rule of law. We have targeted our foreign assistance to support programs that strengthen civil society’s ability to address legal and judicial reform, land rights, anti-corruption, the rights of women and children, prevention of human trafficking, and improving the quality of and access to education. We have also supported reform-minded institutions and individuals, sought to build capacity of public and private institutions, and encouraged expanded political participation by youth and women in elections and political processes. Our foreign assistance is also directed at a broad array of other important issues, including HIV/AIDS, maternal health, demining, professionalization of the military, and promoting economic development. Cambodia’s identification as a “focus country” under the Administration’s “Feed the Future” Initiative allows us to consider ways to expand our assistance into agriculture, food security, and resilience to climate change. The Peace Corps has been active in Cambodia since 2007 and is so popular that the Deputy Prime Minister spoke at the swearing-in ceremony of the most recent group of volunteers. In all, we are aiding Cambodia’s development in FY2010 with more than $72 million, which makes it the fourth largest recipient of Department of State and USAID assistance in the East Asia and Pacific region. In 2004 Cambodia joined the World Trade Organization. Between 2004 and 2008, Cambodia was the seventh fastest-growing economy in the world. This rapid development was driven largely by expansion in the garment, tourism, and construction sectors. The global economic crisis had a particularly painful impact on Cambodian economic growth. Because of a slowdown in external demand and foreign investment, Cambodia’s growth dropped from 10.2 percent in 2007 to negative 2.5 percent in 2009. However, there is a positive sign for recovery: International Monetary Fund (IMF) growth predictions for the Cambodian economy currently range from 4 to 7 percent in 2010 and 2011. The United States has been Cambodia’s top trading partner since 1998, with exports to the United States accounting for approximately 17 percent of Cambodia’s GDP last year. Garments dominate Cambodia’s exports—especially to the United States—and accounted for over $2.6 billion, or 70 percent, of the country’s overall exports between 2007 and 2009. The garment industry employs roughly 350,000 workers, mostly women. Cambodia has developed a relatively good labor record in the garment sector, built through close cooperation with the International Labor Organization and the United States under the Better Work Program. Since the expiration of the World Trade Organization’s (WTO) Multi-Fiber Agreement in 2004, Cambodian garment exports have grown by nearly 20 percent, due in part to safeguards placed on imports of certain apparel from China permitted under China’s WTO accession agreement. These safeguards expired at the end of 2008. Due in large part to poor external demand, merchandise exports contracted by 8.6 percent in 2009, the first annual contraction since the mid-1990s. The Cambodian government, the garment industry, and labor unions are strong supporters of legislation that would allow duty-free access for garments from Cambodia and other less developed countries. Cambodia’s liberal investment regime has led to increased investment from Asian countries, particularly South Korea and China. American investors have lagged behind this trend, but a U.S. commercial presence is starting to expand rapidly. A weak business environment, poor infrastructure, inadequate enforcement of labor laws, and the highest energy costs in the region pose significant challenges to private sector-led growth. The government needs a more comprehensive, coordinated response to improve the competitiveness of Cambodia’s economy. Moreover, irregular adherence to rule of law, endemic corruption, an incomplete regulatory framework, and underdeveloped human resources prevent Cambodia from becoming more economically competitive and hinder its full development potential. For all its growth over the past decade, Cambodia remains one of the poorest countries in Asia, relying on close to $1 billion per year in foreign assistance. Under the United States-Cambodia Trade and Investment Framework Agreement (TIFA) and the Economic Growth Bilateral Assistance Agreement, the United States is seeking to deepen and expand bilateral trade and investment ties. We support Cambodia’s efforts to implement its WTO commitments and other domestic economic reforms, and seek ways to assist Cambodian authorities in areas such as Intellectual Property Rights enforcement, transparency, anti-corruption, and effectiveness of the banking and financial sectors. Debt relief can be an important means of achieving U.S. goals of promoting economic growth, well-functioning financial markets, and economic reform abroad. Longstanding United States policy is to coordinate sovereign debt restructuring internationally, primarily through the Paris Club group of official creditors. This multilateral approach is a good value for the U.S. taxpayer because it increases recoveries from countries that are not paying their debts to the United States while maximizing benefits of debt relief for heavily-indebted, low-income countries that are unable to meet their payment obligations. The United States provides debt cancellation only in limited circumstances, the majority of which are through the Enhanced Heavily Indebted Poor Countries (HIPC) Initiative. This approach provides U.S. resources to pay for the budgetary cost of debt relief for countries that are facing an unsustainable debt burden. To be eligible, HIPC countries must face a debt-to-export ratio greater than 150 percent and a debt-to-revenue ratio above 250 percent, among other factors. In the first stage, debtor countries commit to implementing economic reforms aimed at reducing poverty and avoiding a new build-up of unsustainable debt. Upon successful completion of the first stage, the United States and other Paris Club members jointly evaluate requests for debt cancellation and then reach individual implementation agreements with the debtor country. Throughout the process, State and Treasury officials rely heavily on International Monetary Fund (IMF) and World Bank assessments of a debtor country’s financial need for debt relief and willingness to undertake reforms. Congress has reinforced this need-based approach to debt relief by enacting statutes such as the Special Debt for the Poorest authorization (enacted this year as Section 7033 of Division F, Department of State, Foreign Operations and Related Program, of the Consolidated Appropriations Act, 2010, P.L. 111-117) and the Enhanced Heavily Indebted Poor Countries Initiative (Title V of Appendix E of H.R. 3425, as enacted into law by Section 1000(a)(5) of P.L. 106-113, as amended). These statutes authorize the Executive Branch, under specific circumstances and criteria, to reduce sovereign debts. Cambodia’s public debt is almost entirely external. In 2009, Cambodia’s debt outstanding to foreign creditors was nearly $3.2 billion, over one-quarter of which is owed to the United States and Russia. At the end of 2008, Cambodia’s external public debt was 25 percent of its GDP. According to the most recent assessment by the IMF, Cambodia is at a moderate risk of debt distress, with rising contingent liabilities warranting increased vigilance. IMF data indicate that in 2008, Cambodia’s debt-to-exports ratio was 37 percent and its debt-to-government revenues ratio was 167 percent (net present value terms). Cambodia, therefore, does not qualify for HIPC status. In 2005, HIPC was supplemented by the Multilateral Debt Relief Initiative (MDRI), under which the IMF and the World Bank grant full debt forgiveness to any country that has completed its HIPC program. Cambodia, however, was granted an exception to the usual eligibility criteria for MDRI and benefited from $82 million in IMF debt relief in January 2006. Cambodia’s bilateral debt to the U.S. government remains an irritant to the relationship. A satisfactory resolution of Cambodia’s debt would accelerate the development of an already improving bilateral relationship and enhance Cambodia’s own economic development by improving its creditworthiness and access to international capital markets. Cambodia’s debt stems from shipments of U.S. agricultural commodities, such as cotton, rice, and wheat flour, financed with low interest-rate loans by the U.S. Department of Agriculture (USDA) under Title I of the Agricultural Trade Development and Assistance Act of 1954, or P.L. 480 (now entitled the Food for Peace Act). The United States and Cambodia signed three P.L. 480 Title I agreements in 1972, 1973, and 1974, during the Vietnam War and Cambodia’s turbulent Lon Nol era. The United States accepted significant payments in local currency under a “Currency Use Payment” provision commonly included in such agreements; the remainder of the debt was to be paid in dollars. The Lon Nol regime never consolidated its hold on the country and in 1975 Cambodia fell to the Khmer Rouge, which ceased servicing this debt. Arrears and late interest have accumulated since that time. By the end of 2009, Cambodia’s total debt to the United States totaled approximately $445 million. About $405 million of that amount is in arrears and would be due immediately upon the implementation of any agreement to pay the debt. In 1995, the Paris Club group of creditor nations and Cambodia reached an agreement to restructure Cambodia’s debt on Naples terms – then the most generous treatment in the Paris Club’s “toolkit.” At the time, the United States was by far Cambodia’s largest Paris Club creditor. Cambodia benefited from a 67 percent reduction of certain non-concessional debts and a long-term rescheduling of certain concessional debts. Since all of Cambodia’s debt to the United States was contracted on concessional terms at below-market interest rates, the Paris Club agreement called on the United States to consolidate arrears and future payments scheduled between January 1, 1995 and June 30, 1997 into a new loan payable over 40 years following a 16-year grace period. Debt service falling due on or after July 1, 1997 was to be paid according to the original schedule. Cambodia eventually signed debt agreements with France, Germany, Italy, and Japan to implement the 1995 Paris Club agreement and began paying those countries accordingly. The United States and Cambodia never concluded a bilateral implementing agreement, in part because the Cambodian government refused to accept responsibility for debts incurred by the Lon Nol regime and also because of a disagreement at the time over the amount of debt owed. In February 2006, the Cambodian Minister of Finance indicated that Cambodia agreed with the United States, in principle, that the amount of principal it owed was $162 million. He also agreed to move forward in drafting a Bilateral Agreement implementing the 1995 Paris Club Agreed Minute. Based on this understanding, the United States drafted a bilateral agreement that retroactively implemented the 1995 Paris Club agreement, including USDA’s concessions, and presented it to the Cambodian government in the summer of 2006. The proposed U.S.-Cambodia bilateral debt agreement would reschedule the consolidated P.L. 480 debt at the original interest rate of 3 percent – a highly-concessional rate given the interest rate environment of the early 1970s. To date, the Cambodian government has been unwilling to sign the draft bilateral agreement and now seeks additional concessions. Specifically, it seeks a lower interest rate and/or a debt swap arrangement. Longstanding U.S. debt policy, in keeping with Paris Club principles and U.S. budget rules, is to retain the same interest rate of the original loans in any rescheduling of those loans. Offering a lower interest rate would be an unauthorized form of debt reduction. Cambodian officials have also indicated that domestic political obstacles still make the government reluctant to accept responsibility for debts incurred by the Lon Nol regime. Although some Cambodian observers may argue that this debt is illegitimate, the United States has on its side the international law principle that governments are generally responsible for the obligations of their predecessors. The government of Iraq accepted the debts incurred by Saddam Hussein. The civilian government of Nigeria accepted responsibility for debts accumulated by military governments that ruled the country in the 1980s and 1990s. Similarly, Afghanistan accepted the heavy debt burden left by decades of foreign occupation and civil war. There are many other examples. Senior U.S. government officials have repeatedly encouraged Cambodia to live up to the 1995 Paris Club agreement it signed with the United States and other creditors, and urged it to sign the pending U.S.-Cambodia bilateral agreement without further delay. However, Cambodia may be reluctant to accept the current proposal to settle the bilateral debt issue if it believes there are good prospects of converting a significant amount of the debt service it would otherwise pay to the United States into a form of increased U.S. assistance. Vietnam a debt rescheduling on terms similar to Cambodia’s 1995 Paris Club debt agreement. Vietnam signed a bilateral implementing agreement with the United States in 1997, resumed making scheduled payments, and was in good financial standing when Congress created the Vietnam Education Foundation several years later. This program directs about 40 percent of Vietnam’s total debt payments to the Foundation for joint education initiatives. Because Cambodia is not making scheduled payments, such an individualized debt-swap program is not a possibility. The Administration is concerned that creating a special statutory debt reduction program for a country that is unwilling, rather than unable, to pay its debts sets a poor precedent for other counties in similar circumstances and sends the wrong message about prudent debt management. Cambodia has accumulated arrears to the United States while paying other creditors on time, and in at least one case, early. Every year, both within and outside of the Paris Club context, the United States reviews and declines similar requests for debt-for-assistance swap arrangements from debtor countries that are current on their debt service and may owe billions of dollars of debt. The Administration has therefore urged the Cambodian government to sign the pending bilateral debt agreement and re-establish a track record of timely repayments under that agreement. We have told the Cambodian government that if it makes scheduled payments for at least one year, the U.S. government would communicate to the IMF that efforts are underway to resolve official arrears. This action could pave the way, should Cambodia then obtain an IMF program and a future Paris Club debt treatment, for a rescheduling of the accumulated arrears. Unfortunately, the Cambodian government has not responded to this overture and continues to accumulate arrears on debts owed to the United States. Congress has also expressed its view on the importance of maintaining orderly creditor-debtor relations in a number of statutes, including Section 620(q) of the Foreign Assistance Act of 1961 and the Brooke Amendment (enacted this year as Section 7012 of Division F, Department of State, Foreign Operations and related Programs, Consolidated Appropriations Act, 2010, P.L. 111-117). These statutes provide for an automatic cutoff of U.S. economic assistance to a country that is in default on certain loans for certain periods of time. Although Cambodia’s USDA debts are not subject to these default sanctions, these statutes reflect Congress’s expectation that countries repay their debts to the United States in a timely manner. Another concern about funding foreign assistance programs through the principal and interest payments of debtor counties is that it circumvents normal budget rules. Congress passed the Federal Credit Reform Act of 1990 requiring U.S. creditor agencies to make realistic estimates about recoveries when calculating the true cost of lending programs. This approach saves U.S. taxpayers money by creating transparent incentives for agencies to manage credit programs efficiently and effectively. Accordingly, the Administration requests, and Congress annually appropriate, funds to be used to pay the U.S. budget cost of cancelling a country’s debt obligation or providing a debt swap. The Cambodian proposal would circumvent this congressional budget oversight mechanism. In sum, Cambodia’s prompt agreement to resolve U.S. debt claims by drafting a Bilateral Agreement implementing the 1995 Paris Club Agreed Minute, as Cambodian officials proposed in 2006, would eliminate this long-standing dispute in a scenario of otherwise improving bilateral relations. A Cambodian agreement would also enhance the country’s creditworthiness and its ability to access international capital markets. Other countries following this path have benefited enormously. Mr. Chairman, I appreciate this opportunity to appear before you today and welcome any questions you may have. Thank you. I am a new generation of the Khmer people. We love our country and our cultures. I don’t think U.S will forgive for Cambodian Debt! Phuket News - Thais ask: Who owns the jeep? Phuket News – Thais ask: Who owns the jeep?